The Sport Management Club at Syracuse University was honored with the Community Team Spirit Award at the Salvation Army’s 45th Annual Civic Celebration held Sept. 14 at the Oncenter. Kevin Reese ’17, co-chair of the Club’s Charity Sports Auction, accepted the award on behalf of the club in the company of more than 800 attendees, including the guest speaker, actor Richard Gere. Kevin Reese ’17, co-chair of the Club’s Charity Sports Auction, accepted the award on behalf of the Club. This prestigious award recognizes the efforts of the Sport Management Club, a student-run organization in Falk College’s sport management department whose 11th Annual Charity Sports Auction raised $40,470 for the Salvation Army of Syracuse. A silent auction was held Dec. 2, 2015, during a Syracuse University men’s basketball game, where auction supporters bid on hundreds of items, from sports collectables to major sporting events tickets. The club partnered with Steiner Sports Memorabilia to host an online auction, as well. 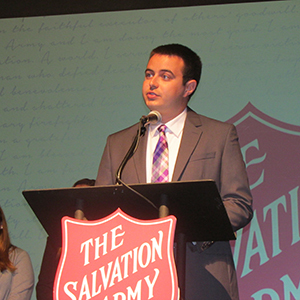 The Salvation Army’s Annual Civic Celebration is one of Syracuse’s most enduring community events, honoring selected community members for their civic and charitable efforts, updating supporters on the organization’s work and featuring a nationally known speaker. In 2008, in honor of its 50th anniversary for excellence in education and contributions to the Syracuse community, Falk College’s School of Social Work received the Salvation Army’s Community Team Spirit Award. Since its founding in 2005, the Sport Management Club has raised over $312,000 for local charities. Previous beneficiaries of the charity auction have included the Boys & Girls Clubs, American Diabetes Association, Golisano Children’s Hospital at Upstate, the Ronald McDonald House Charities of CNY, the Upstate Cancer Center, Special Olympics New York, Food Bank of CNY and Make-A-Wish of Central New York. For more information about this year’s charity auction or how to support it, please visit www.sucharitysportsauction.com.